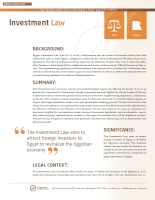 Background: Egypt’s Investment Law (Law No. 72 of 2017) was issued as part of a series of economic reform laws that collectively seek to meet Egypt’s obligations under the $12 billion International Monetary Fund loan agreement. The House of Representatives approved the draft law in early May 2017; it went into effect after President Abdel-Fattah El Sisi ratified the law and it was published in the Official Gazette on May 31, 2017. The implementing regulations of the Investment Law were passed in October 2017. Authorities have moved to amend the law, as the cabinet approved amendments on March 6, 2019; these amendments are currently being debated in the House of Representatives..
Summary: The Investment Law promotes remote and underdeveloped regions by offering tax breaks of up to 50 percent for investments in these areas, though companies are only eligible for the tax breaks if they are established within a three-year period of the issuance of the law’s implementing regulations. Additionally, the law offers rebates on land acquisition costs for factories, primarily in underdeveloped regions, as long as they begin operations within a two-year period after breaking ground. The law reestablishes free zones that are subject to a two-percent fee on generated revenues to be collected and evenly split between the Ministry of Finance and Ministry of Investment. The law also expands its scope to industries not previously eligible for incorporation under previous investment legislation, such as education, sports, and waste recycling, representing an increase in the types of businesses that will be eligible to incorporate; previously, recognized industries had primarily included manufacturing, such as automobiles and pharmaceuticals. Significance: The Investment Law aims to attract foreign investors to Egypt to revitalize the Egyptian economy. The financial rebates and tax breaks for factories included in the law are meant to provide significant incentives for companies to begin operations in Egypt. Legal Context: The Investment Law was passed after nearly two years of debate and revisions to the legislation. It repeals the Investment Guarantees and Incentives Law (Law No. 8 of 1997). The new Investment Law includes similar components to the 1997 one but offers some additional incentives, consolidates previous amendments made to the 1997 law, and removes certain previously identified investment obstacles. During the legislative process, members of the House of Representatives offered conflicting opinions on the law, with some stating that the law would help reduce state bureaucracy, while others dismissed the law’s necessity and instead called for a revitalization of efficient practices in order to improve the economic situation. Political Context: The Investment Law was approved to help implement a number of obligations to which Egypt agreed with the IMF, under which the country received a $12 billion loan. The Investment Law was, among others, passed to capitalize on benefit expected from loosening restrictions on the exchange rate by attracting foreign capital, while streamlining the red tape associated previous investment legislation. Similarly, an IMF progress report on Egypt’s economic reforms noted that the country had made progress in developing investment opportunities beyond the sectors that traditionally attract the bulk of foreign investment. Adherence to Legal Norms: Articles 27 and 28 of the constitution commit the Egyptian state to encouraging investment and to “providing an environment that attracts investment.” Accordingly, the country’s new Investment Law was ratified in furtherance of these provisions. Critics, however, have noted that, in the absence of accompanying anti-corruption legislation or reforms, the Investment Law offers little to combat corruption and the increasing economic influence of the military, despite a constitutional commitment in Article 218 to fight corruption. Implementation: The Investment Law was welcomed widely among the business, investment, and donor communities upon its passage. By way of example, First Deputy Managing Director and Acting Chair of the IMF’s Executive Board David Lipton was quoted as saying, “An industrial licensing law and a new investment law have been passed, and … are critical pieces of legislation necessary to strengthen the business climate, attract investments, and promote growth.” Similarly, the World Bank noted in its “Doing Business 2019” report and in its report entitled, “Egypt: Enabling Private Investment and Commercial Financing in Infrastructure,” that Egypt has opened additional mechanisms for public funding, such as through efficient tax payment systems, to ease the process for international investments into major infrastructure projects. Despite the praise the law has garnered, authorities have already moved to amend the law, as the cabinet approved amendments to the law on March 6, 2019; the amendments are currently being debated in the House of Representatives. Notable aspects of the proposed amendments include the imposition of a registration fee and measures that would allow more companies to enjoy financial benefits of the law, including tax incentives. Text of the Law: The official text of the Investment Law is available here in Arabic. The official text of the implementing regulations of the Investment Law is available here in Arabic.